Overwhelmed First Time Parent to Be? Products to Get You Started! Becoming first time parents can be overwhelming, especially when you make your first trip to the store for your registry. With products and brands galore, from strollers to breast pumps, how could one possibly know what they need and which ones to choose? That is how we felt on our first trip to the store, but after a bit of time and lots of research and first hand experience, I have hand picked a few staples to help get you started. I will be writing a few articles as I discover new helpful products. Stroller: The UPPAbaby brand baby strollers are all the rage on the Upper West Side of Manhattan. On one block, one may see five different colors of the UPPAbaby VISTA or the UPPAbaby CRUZ. For city living, I can understand why this is such a beneficial stroller. The wheels are sturdy and suspension excellent. It also has a big basket underneath the seat for lots of grocery shopping and errands with your little one. 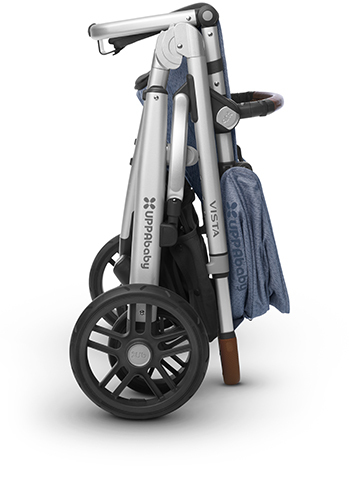 The vista has a variety of configurations and maneuvers like a single stroller with the ability to adapt as a family grows. It comes with a bassinet and a toddler seat with multiple positions. They are both interchangeable and requires no fabric swapping. The canopy adjusts as your child grows and has an extendable 50+ sunshade. If you plan on having another baby in the next few years, the seat selections and configurations can comfortably hold two Mesa infant car seats with a direct configuration and no attachments, two bassinets, and two toddler seats. if you add the PiggyBack Ride Along Board, three can comfortably ride. The UPPAbaby CRUZ is also compatible with the Mesa and is streamlined and compact without compromising on function. It has an easy one step fold with or without the seat attached. 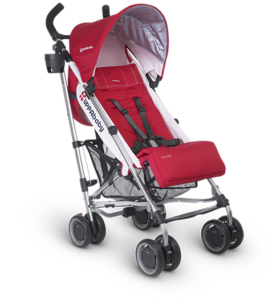 The UPPAbaby G-LUXE is the lightest full size reclining stroller in its class. It has a one-wheel lock brake, easy access, large basket, an extendable SPF 50+ sunshade, one-handed recline and adjustable footrest. The fabric is removable and washable. 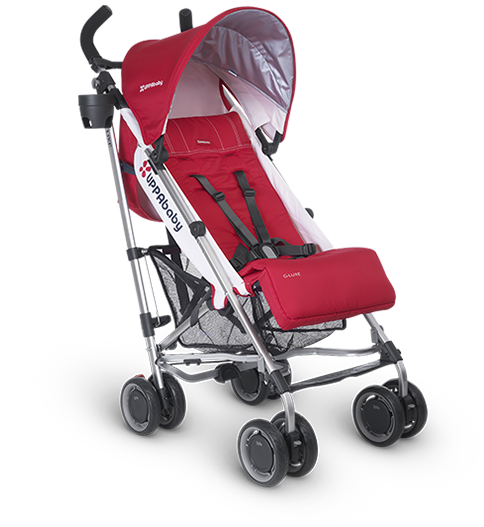 The UPPAbaby G-LITE stroller is one of the lightest full-size umbrella strollers available weighing 11 pounds. 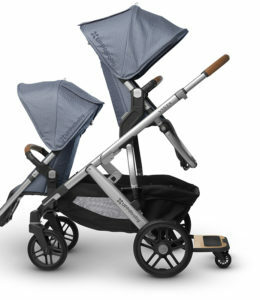 The UPPAbaby G-LINK stroller is perfect for someone with twins. The side by side reclining seats and adjustable footrests have an independent one-handed adjustable recline with four positions. Carseat: The UPPAbaby MESA infant car seat is suitable for babies from 4 to 35 pounds and up to 32 inches in height. It is the only car seat on the market that uses the smart secure system. It has self-retracting mini latch connectors and a red to green tightness indicator that allows for a quick, accurate and easy installation. It has advanced side impact protection, exceeding the proposed NHTSA safety standards for SIP. 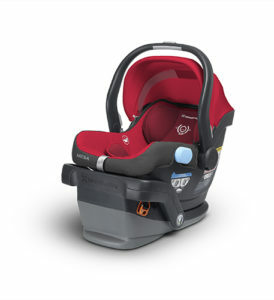 The integrated headrest design keeps an infant’s head stationary during a side impact collision. The car seat comes in a variety of colors. If choosing the Henry (blue marl), it is constructed of merino wool, which is fire resistant. It is a soft breathable fabric that is comfortable in both warm and cool temperatures. Nursing Bras: They are not kidding when they say your breasts increase in size when pregnant. I think I needed a new bra every few weeks through the first half of my pregnancy. Then in the second half, the belly keeps expanding that your bra needs also seem to expand. Some say to stop wearing underwires so it doesn’t inhibit your milk production. Regardless, I think if one can find a supportive bra without an underwire, it’s good for your breast health. However, as a woman who has always needed an underwire for support, I find it hard to find a good bra that still gives me a somewhat decent shape. That was until I discovered Bravado! Design Nursing Bras. Their silk seamless bras and camis that are so soft and comfortable while also offering great support for women of all sizes. I have tried the Body Silk Seamless Nursing Bra, the Yoga Nursing Bra and the Body Silk Seamless Nursing Cami. Two brand new limited-edition colors are the sea glass for the nursing bra and Dove Heather for the yoga bra. The cami comes in black and white. I love the Body Silk Seamless Nursing Cami because it can be worn underneath a shirt or sweater and because the Body Silk Seamless Bra is knitted inside, there is no need to wear a bra too. The four-way stretch fabric hugs your changing shape and has convertible criss-cross straps. The nursing bra also has the four way stretch fabric and it includes a conversion kit that converts the bra to a regular bra once you are done nursing, so you don’t have to worry about spending money on a bra you’ll only wear for a short time. For maximum skin-to-skin contact, the bra cups drop away fully. Pregnancy and Nursing Pillows: Friends kept telling me how much they loved their full body pillow they used during pregnancy. I thought I was doing just fine with my two memory foam pillows – one for under my head and one for between my knees. That was before I was introduced to the Boppy Multi-Use Slipcovered Total Body Pillow. If you’re pregnant, you’re probably waking up one to three or more times a night to either go to the bathroom or from restlessness. I can’t guarantee you won’t need to still go to the bathroom in the middle of the night, but I have found I am far less restless when cuddled up to my pillow. It provides complete head-to-tow support including comfort to your neck, belly, back and hips. The slipcover is made from 100% cotton, wipeable and machine washable. According to recent studies, poor sleep can lead to longer labor, preterm birth and gestational weight gain. Therefore, don’t take a good night’s rest lightly! If you’re afraid your partner may get jealous of this new addition taking over your bed, the Boppy Pregnancy Support Pillow is a smaller-sized body pillow that provides just the right support for the hips, legs and bump. The Boppy Back and Bump Support Pillow is perfect for helping with the recommended side sleeping during pregnancy. It supports both the belly and back in a compact design. While I always intend to sleep on my side, inevitably I still end up on my back. This pillow helps keep me in place and supports the back muscles and ligaments which are getting loser as the pregnancy progresses. If you just want a wedge to place at any point on your body, the Boppy Pregnancy Wedge is a firm, versatile pregnancy cushion you can use on your back, bump or between your knees. It also makes for a great lumbar support while sitting. 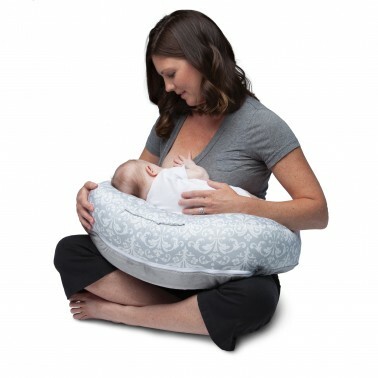 After baby is born, the Boppy Nursing and Feeding Pillow provides great support while breast or bottle feeding. In my next article, I will give helpful product tips for bassinets, carriers, and more! Keep smiling – your new addition will be here soon and while you will always worry about your child, hopefully you’re a little less worried about about which products are best for getting started!